Themistius’ paraphrase of Aristotle’s On the Heavens, which is extant only in the Hebrew and Latin translations, announces at its beginning that the term “Heaven” has three meanings. The same tripartition features at the beginning of Simplicius’ commentary: both Themistius and Simplicius depend upon Alexander’s lost commentary. However, in the Hebrew version of Themistius’ paraphrase only two meanings are given. The Latin version seems prima facie to be sound, because there are three meanings listed; however, the second meaning of the Latin is the “fifth body”, something which does not match the second meaning in Simplicius. In this article it is argued that the “fifth body” of the Latin version is a commonplace emendation by the translator Moshe Alatino: it has no chances to have been the original reading of Themistius’ paraphrase, let alone of Alexander of Aphrodisias’ lost commentary, as it has been surmised in recent scholarship. The aim of this paper is to provide a survey of a few Syriac texts, from the 6th to the 9th century, dealing with some questions about the soul. Except for the first treatise, a "Logos peri psychès" translated from Greek into Syriac, all the others were composed in Syriac, by Aḥudemmeh (6th century), Jacob of Edessa (7th century), John of Dara and Moshe bar Kepha (9th century). In this paper we are interested in the properly philosophical aspects of the works, even if the context of their composition was religious. It will emerge that a brief corpus of questions is common to all the authors, – questions about the existence, the incorporeality, the simplicity, the eternity of the soul. Moreover, as it will appear, some authors tried to find harmony between philosophy and theology. Kalām and Falsafa Integrated for Divine Unity Saʿīd b. Dādhurmuz’s (5th/11th century) "Risāla fī l-Tawḥīd"
This study is an attempt to set the backdrop for an Arabic manuscript which was copied in the second half of the 5th/11th century. It contains a treatise by a certain Saʿīd b. Dādhurmuz, whose name does not feature in any biographical source whatsoever. 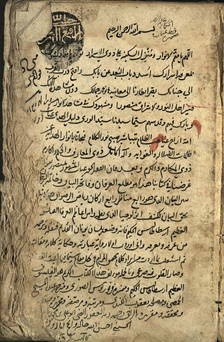 Saʿīd b. Dādhurmuz wrote the treatise upon receiving a request from a friend to write on tawḥīd (unity), a fundamental theme in classical Islamic theology and philosophy. The treatise, like the other works by the author in the same maǧmūʿa, does not mention any title or a name, although it is clear that the author depends upon many sources belonging to different discourses in Islamic thought. In order to elucidate the character and method of the "R. Fī l-Tawḥīd", both falsafa and kalām must be taken into account. As for his philosophic affiliation, Saʿīd b. Dādhurmuz belongs to the tradition of al-Kindī (d. after 252/866), and gets especially close to Abū l-Ḥasan al-ʿĀmirī (d. 381/992), as shown by his quotations of Greek sources typical of the "circle of al-Kindī". In kalām, as shown by his discussion of the origin of the world and God’s attributes, he strictly follows Muʿtazilite theology. All in all, the treatise exhibits a combination of the two disciplines as they developed in the 4th/5th century AH. In this paper, I only address the aspects which help to contextualize the main topics of the treatise, without providing the full survey which I am planning for a future extensive study of Saʿīd b. Dādhurmuz and his work. An extremely interesting case of the Graeco-Latin and Graeco-Arabic transmission of philosophical texts is represented by Proclus’ monograph on the Platonic proofs for the immortality of the human soul. Lost in Greek, this text has come down to us only indirectly, both in Latin and in Arabic. We can read it as embedded in Priscianus’ Solutiones ad Chosroem, extant in the Latin version of the 9th century, and as embedded in Miskawayh’s Kitāb al-fawz al-aṣġar. This article is devoted to the comparison of these two texts. The "Liber qui uocatur Suda" in the Latin translation by Robert Grosseteste (ca. 1168-† 8/9 October 1253) is transmitted in an incomplete form in two manuscripts housed in London (R) and Oxford (D) respectively. The Liber results from Grosseteste’s selection and Latin translation of a few entries from the Byzantine Suda. The present text is the editio princeps of this translation and counts as a preliminary step to a wider editorial project, in which the whole of the Suda as translated by the Bishop of Lincoln will be edited critically. The introduction to the present edition, based on mss. R and D, lists fifteen witnesses preserving chapter 2 (the entry Ἰησοῦς in the Suda). The relationship between these witnesses and the double redaction of this chapter is also discussed. The authors investigate the composition and features of the Liber and provide the first edition of the text, accompanied by the account of the ecdotic criteria adopted. The “Perfect King” and his Philosophers Politics, Religion and Graeco-Arabic Philosophy in Safavid Iran: the case of the "Uṯūlūǧiyā"
During the long span of time which divides the age of Avicenna and Suhrawardī on the one hand, and that of the Safavid empire on the other, the pseudo-Theology of Aristotle seems prima facie to have sunk into oblivion in Persia. Closer study of the manuscripts of this work housed in the libraries of Iran, and of their readers, permits us to ascertain that this is not the case. This article, issued from the missions conducted within the context of the ERC Project 249431 “Greek into Arabic”, narrows the focus on the early Safavid era and shows the background of the interest in the pseudo-Theology of some scholars of that milieu. In particular, the discovery of a Prologue to the pseudo-Theology by Ġiyāṯ al-Dīn Manṣūr Daštakī (d. 949/1541) is accounted for, and some implications of this text are discussed. The Lectures of the International Centre “Incontro di culture” : lecture held on February 13th, 2007 - 2nd meeting of the programme GrAL, "Formazione e diffusione del corpus platonico dall’antichità al mondo di lingua araba". The Lectures of the International Centre “Incontro di culture” : lecture held on May 11th, 2009 - 4th meeting of the programme GrAL, "Dal greco all ’arabo e al latino: i Parva Naturalia di Aristotele". The Lectures of the International Centre “Incontro di culture” : lecture held on February 12th, 2008 - 3rd meeting of the programme GrAL, "Il De Anima di Aristotele: esegesi greche, arabe e latine". Interprétations néoplatoniciennes du "De Anima"
The Lectures of the International Centre “Incontro di culture” : lecture held on February 12th, 2008 - 4th meeting of the programme GrAL, "Il De Anima di Aristotele: esegesi greche, arabe e latine". The Lectures of the International Centre “Incontro di culture” : lecture held on May 12th, 2009 - 4th meeting of the programme GrAL, "Dal greco all ’arabo e al latino: i Parva Naturalia di Aristotele". The Lectures of the International Centre “Incontro di culture” : lecture held on May 29th, 2012 - 7th meeting of the programme GrAL, "L’ Etica Nicomachea: recezione tardo-antica, araba, bizantina e medievale". [Cristina D'Ancona] R. Chiaradonna - G. Galluzzo (eds), Universals in Ancient Philosophy, Edizioni della Normale, Pisa 2013 (Seminari e convegni, 33) / [Angela Ulacco] Christoph Helmig, Forms and Concepts. Concept Formation in the Platonic Tradition, De Gruyter, Berlin - Boston 2012 (Commentaria in Aristotelem Graeca et Byzantina, Quellen und Studien, 5) / [Cecilia Martini Bonadeo] R. Hansberger - M. Afifi al-Akiti - Ch. Burnett (eds), Medieval Arabic Thought. Essays in Honour of Fritz Zimmermann, The Warburg Institute - Nino Aragno Editore, London - Turin 2012, (Warburg Institute Studies and Texts, 4) / [Germana Chemi] L.P. Gerson, From Plato to Platonism, Cornell U. P., Ithaca - London 2013 / [Cristina D'Ancona] R. Arnzen, Platonische Ideen in der arabischen Philosophie. Texte und Materialien zur Begriffsgeschichte von “Ṣuwar Aflāṭūniyya” und “Muthul Aflāṭūniyya”, De Gruyter, Berlin - Boston 2011 (Scientia Graeco-Arabica, 6) / [Cecilia Martini Bonadeo] D. Janos, Method, Structure, and Development in al-Fārābī’s Cosmology, Brill, Leiden - Boston 2012 (Islamic Philosophy, Theology and Science. Texts and Studies, 85) / [Germana Chemi] A Philosophy Reader from the Circle of Miskawayh edited and translated by E. Wakelnig, Cambridge U. P., Cambridge 2014 / [Cristina D'Ancona] J. Thiele, Kausalität in der muʿtazilitischen Kosmologie. Das Kitāb al-Muʾaṯṯirāt wa-miftāḥ al-muškilāt des Zayditen al-Ḥasan ar-Raṣṣāṣ (st. 584/1188), Brill, Leiden - Boston 2011 (Islamic Philosophy, Theology and Science, 84) / [G. Giacomelli] C. Martini Bonadeo, ʿAbd al-Laṭīf al Baġdādī’s Philosophical Journey. From Aristotle’s Metaphysics to the “metaphysical science”, Brill, Leiden - Boston 2013 (Islamic Philosophy, Theology and Science. Texts and Studies, 88) / [Elisa Coda] H. Pasqua (ed. ), Nicolas de Cues et l’Islam, Éditions de l’Institut Supérieur de Philosophie - Peeters, Louvain-la-Neuve - Leuven - Paris - Walpole (MA) 2013 (Philosophes Médiévaux, 59).